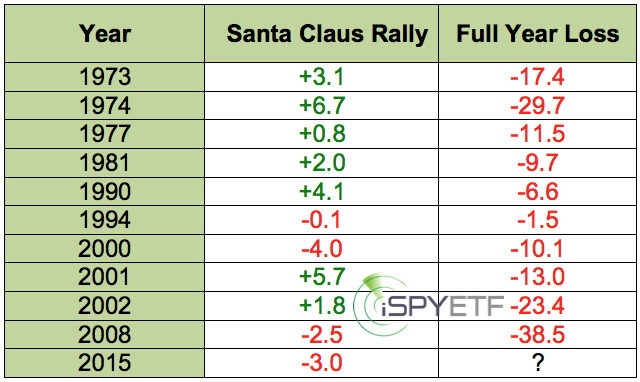 The Santa Claus Rally (SCR) is a popular topic of discussion this time of year. Along with the SCR chatter comes this popular aphorism: “If Santa Claus should fail to call, bears may come to Broad and Wall.” Is this rule of thumb correct? Since 1970, the SCR occurred 34 of 46 years, or 73.9% of the time (SCR numbers are based on the S&P 500, last five trading days of the old year and first two trading days of the new year). If used as a full-year barometer (as the SCR goes, so goes the following year), the SCR has an accuracy ratio of 64.4%. Since 1970, the S&P 500 has recorded 35 annual gains. The stock market’s bias is generally bullish and in harmony with 34 SCRs. The SCR’s track record in down years is dismal. Since 1970, the S&P has suffered 10 annual losses. Only 2 of those 10 losses were preceded by negative SCRs. The table below shows all the details. Based on our major market top indicator, there’s trouble ahead for 2016. However, based on statistical evidence, we won’t be able to use the SCR (or absence of SCR) as on early confirmation of the major market top indicator. As long as the bullish divergence and support at 1,993 hold, positive December seasonality deserves the benefit of the doubt. 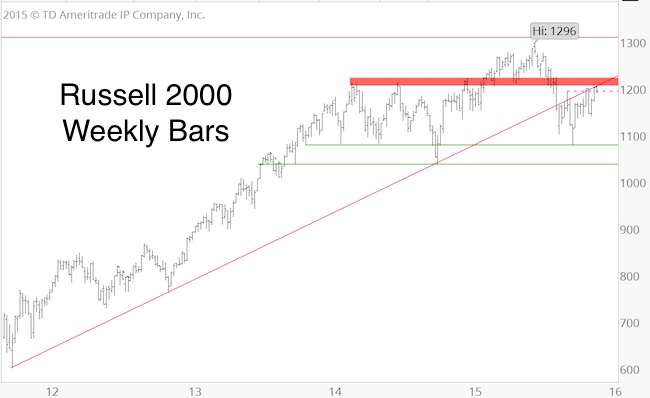 S&P 500: Year-end Rally or Breakdown? 2015 has been the year of trading ranges. The S&P 500 was stuck in a 100-point range from February to August and again from October until now. Prolonged periods of zig-zagging tend to wear down support/resistance levels and dilute the effectiveness of technical analysis. As of December 11, the S&P 500 was down 3.27%. Such poor performance is unusual for December. In fact, since 1970, the S&P 500 lost more than 3% after the first nine December trading days only four prior times (1975, 1980, 1996, 2002). 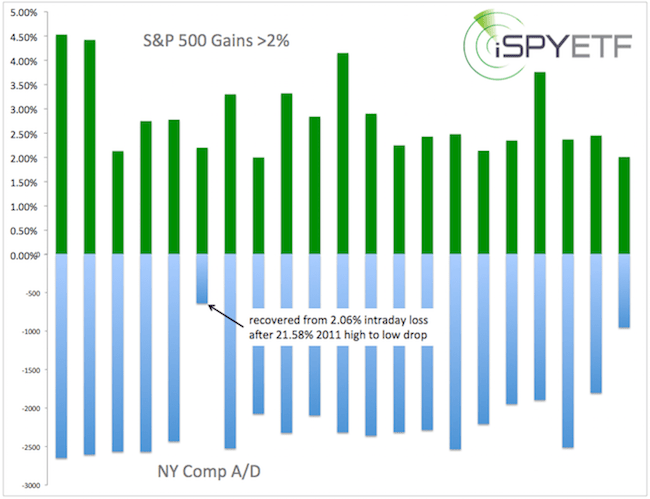 The graphs below (originally published in the December 13 Profit Radar Report) represent all years with 3%+ losses after the first nine December trading days (dashed black line) along with the performance over the next 30 trading days. 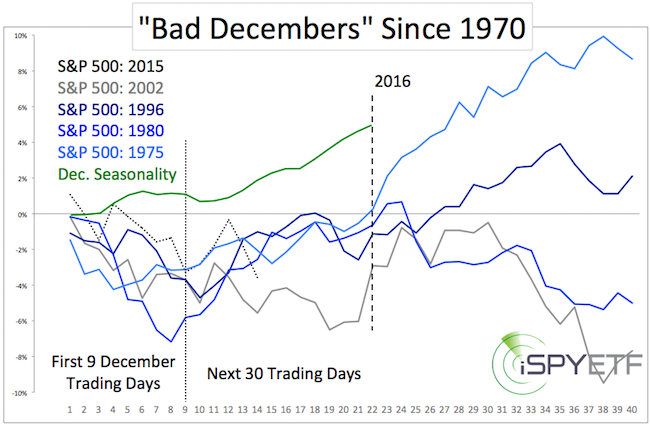 December seasonality (green graph) typically turns notably bullish in mid-December. Last week (Thursday/Friday), the S&P had two 1.5% back-to-back losses in the second half of December. According to SentimenTrader, this hasn’t happened since 1937. Since 1928, there’ve only been eight back-to-back losses of more than 1% during the second half of December. All of those were during bear markets, but the S&P ended the year above the second down day level every single time. The December 6 Profit Radar Report pointed out extremely weak market breadth (more details here: Why are Stocks Down Despite Bullish Seasonality?). Buyers fatigue is not always a short-term timing toll, but it’s been like a dark cloud over Wall Street, and certainly contributed to the lousy December performance. There’s a small tell tale sign that buyers may be awakening (perhaps only for a little while). How so? As the chart below shows, on Friday, the S&P closed at the lowest level since October 13. Some market technicians may consider this a technical breakdown, however, there was a bullish divergence between the S&P 500 and the percentage of NYSE stocks above their 50-day SMAs. At least by one measure, selling was not as strong as price suggests. More often than not that’s a good sign. Based on technicals, last week’s low at 1,993 seems important for the S&P 500. What Does the Junk Bond Meltdown Mean for Stocks? In the land of low interest rates (ZIRP), high yield junk bonds are king. Never mind the additional risk. At least that’s how it used to be. But reality has a tendency to make unexpected appearances, and it certainly made its presence known to yield hungry and risk ignorant junk bond investors. Starting in June 2014, junk bonds turned sour. “The Greek drama is fueling a fair amount of crisis talk. We anticipate an equity correction soon and a full-blown bear market eventually (2016? ), but that doesn’t mean other asset classes can’t turn down sooner. Economic recessions are a diffuse process, not a sudden all-encompassing event. Investors with money in high yield funds should watch support levels and exercise appropriate risk management. 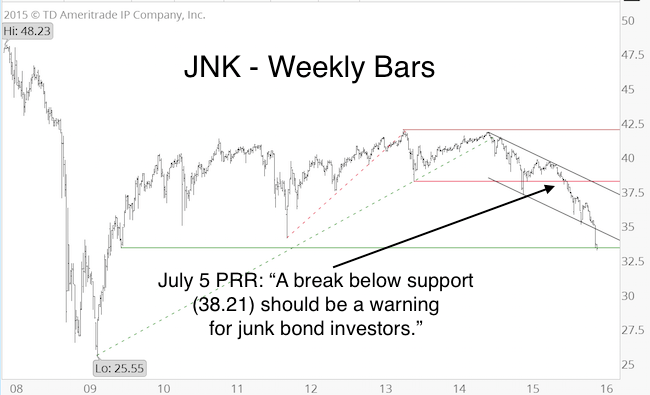 JNK lost 20% since June 2014, and 13% since violating support at 38.21. It looks like junk bonds have entered a bear market already. JNK may catch a bid around support at 33.30, but there are no bullish divergences. A move above the lower trend channel line is the minimum requirement to pause the selling for more than a week or two. The junk bond decline has robbed investors (particularly retirees) of yet another income source. Yes, economic recessions are a diffuse process, and junk bonds may be one of the first asset classes to drift into a new bear market. Why are Stocks Down Despite Bullish Seasonality? In terms of seasonality, December is the strongest month of the year. Nevertheless, the S&P 500 is down almost 2% since its December 1st pop. Why? One reason is buyers’ fatigue. “The S&P 500 rallied 2.01% on Friday. Since the beginning of 2011, the S&P 500 gained more than 2% on 21 days. On average, 2171 stocks advanced (based on NYSE advancers/decliners) on those days. On Friday, only 953 stocks advanced. In other words, breadth behind Friday’s gain was dismal. The chart below lists all 2%+ S&P 500 gains since 2011 and the accompanying NYSE advance number (inversed for easier viewing). Seasonality still suggests further gains, but based on market breadth (or lack thereof), risk management is becoming more important. What is Driving Oil Lower? OPEC inaction, decreased consumption, new extraction methods. There are many reasons why oil ‘should’ be down. However, none of them is (or was) predictable. For example, back in June the Wall Street Journal and Forbes reported that oil demand is rising. Oil traded above $60 a barrel at that time. Back in October, CBS News asked: “Could an oil price spike slam the US again?” The question turned out to be a mute point. If the direction of oil prices is so obvious, why do the media and analysts continuously get it wrong? Forecasting prices obviously entails more than slapping a news event on a price event after the fact. 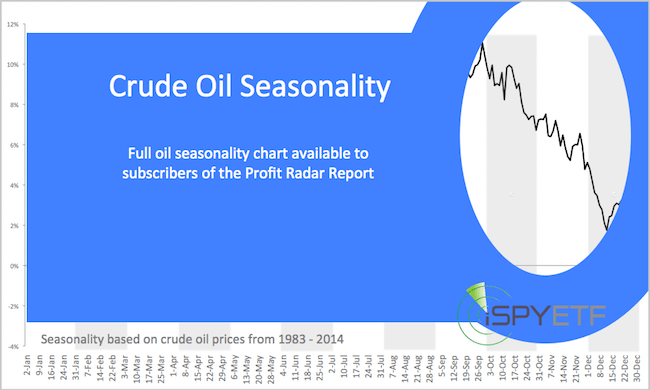 Seasonality is an ingredient of every Profit Radar Report market forecasts. 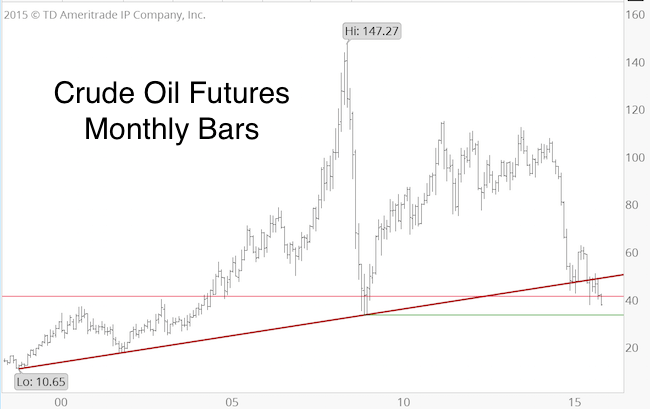 Based on technical analysis, oil is now in the general support area likely to spark a bounce eventually. Seasonality is turning gradually bullish in mid-December, but the big seasonal buy signal won’t occur until next year. Seasonality is not always correct, but betting against an obvious seasonal pattern (such as oil’s September – December rut) is like booking a Caribbean vacation during hurricane season. The Best Place for Tell Tale Signs: Small Caps? The S&P 500 inched up a pitiful 0.03% last week. The Russell 2000 rallied 2.33%. But that’s not the only reason small cap stocks are worth a second look right now. As the weekly bar chart below shows, the Russell 2000 (NYSEArca: IWM) is bumping against significant double resistance. The November 29 Profit Radar Report stated that: “Last week’s push higher happened during a holiday week on low volume, and therefore needs confirmation. RSI just barely failed to issue a bullish confirmation. This digestive period is now underway. Regardless of the immediate down side risk (which should be limited), the Russell 2000 sports the most pronounced overhead resistance. A strong move above resistance may be the best tell tale sign of further gains. The Profit Radar Report will monitor the strength of any breakout to assess its longevity. More than any other asset class, the Volatility Index (VIX) is subject to distinct patterns or biases that either help or hurt investors. Being aware of the 3 VIX tricks discussed below will significantly increase the odds of a winning trade. 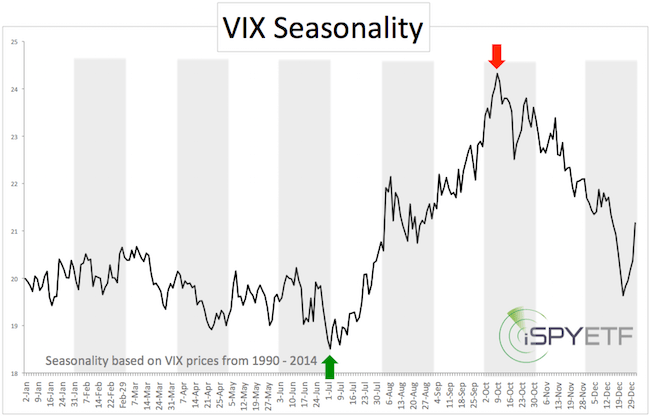 I invite you to inspect the VIX seasonality chart below. Based on 25 years of trading history, there are two important seasonal turning points: July 2 and October 9. The VIX has a strong tendency to move higher starting in early July (green arrow), and to move lower after early October (red arrow). Shortly thereafter the VIX rallied from 12 to 20 and eventually to 50. Due to the massive summer spike, this year’s October sell signal was shifted. The October sell signal is particularly intriguing because it gets magnified by a major bias of inverse VIX ETPs (Exchange Traded Products, such as ETFs and ETNs). This bias can be worth 0.25% per day for weeks. ETPs like the iPath S&P 500 VIX ETN (VXX) or the VelocityShares Daily Inverse VIX ETN (XIV) use futures (or options) to replicate VIX-related performance. 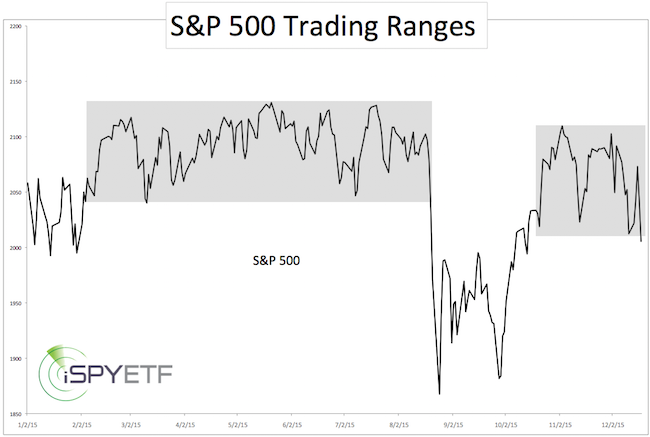 The performance of futures-based ETPs is typically cannibalized by a condition called contango. However, a bet on lower VIX prices allows investors to turn this generally harmful condition into a superbly beneficial tail wind. Below is an admittedly dry explanation of contango, but I think you will find it well worth your time (no pain, no gain). The VIX quoted in-day-to-day life is the CBOE Volatility Index (VIX) spot price (today’s VIX price). However, the futures used to create VIX ETPs are based on the future VIX price, which is almost always more expensive than the spot price. Over time the more expensive VIX futures decline in value, eventually converging with the spot price at expiration. Contango generally exists when the VIX is trading below 20. The opposite of contango – backwardation, when future VIX prices are lower than at present – generally appears when the VIX trades above 20. I wrote a detailed report on how to actually make contango work for investors back on August 24, 2014 (entire report available to subscribers of the Profit Radar Report). The two biggest beneficiaries of the ‘reverse contango’ benefit are the VelocityShares Daily Short-term VIX ETN (NYSEArca: XIV) and ProShares Short VIX Futures ETF (NYSEArca: SVXY). The chart below compares the VIX with its inverse counter part, XIV. Shown is the cumulative percentage return from January 3, 2011 to August 15, 2014. It quickly becomes obvious that XIV has risen much more than the VIX has fallen. XIV is an inverse VIX ETN. For an apples to apples analysis of the excess return, here is a comparison between XIV and an inverse VIX (the VIX inversed). 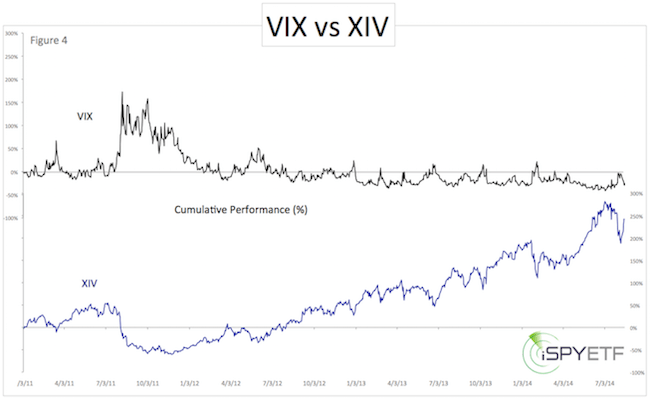 From January 3, 2011 to August 15, 2014, XIV outperformed the inverse VIX by 217% (0.24% per day). Obviously the reverse contango benefit doesn’t guarantee a profitable trade, but on average XIV provides a ‘daily edge’ of 0.25%. At times, the edge is much more pronounced, such as on November 30, 2015, when the VIX rose 6.68%, but XIV gained 0.74% (when it should have lost some 6.68%). As you may have noticed from the two above Profit Radar Report quotes, the Bollinger Bands can be very helpful when it comes to spotting buy/sell signals, especially when they occur near the two major seasonal turning points (see chart below). Simple support/resistance levels and trend channels can also be of help. 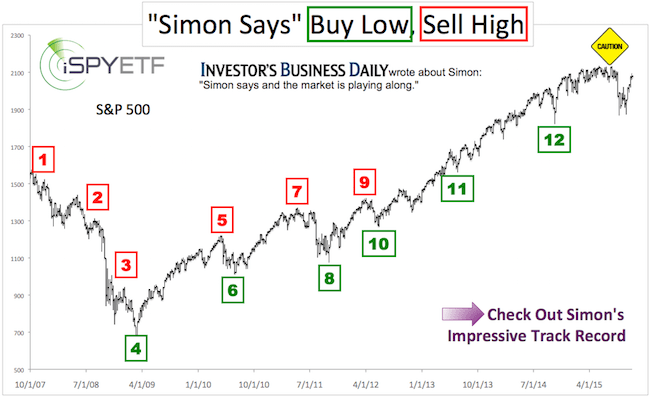 The green/red arrows below highlight the buy/sell signal given by the Profit Radar Report. 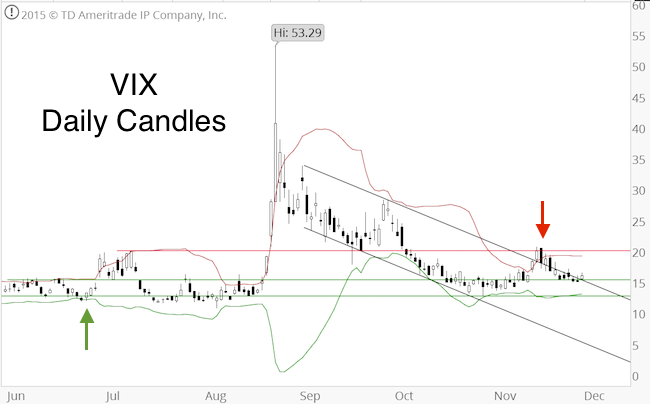 Seasonality and technical analysis triggered a VIX sell signal on November 16. The sell signal remains active and the ‘contango tailwind’ should by overall positive for XIV until late December. 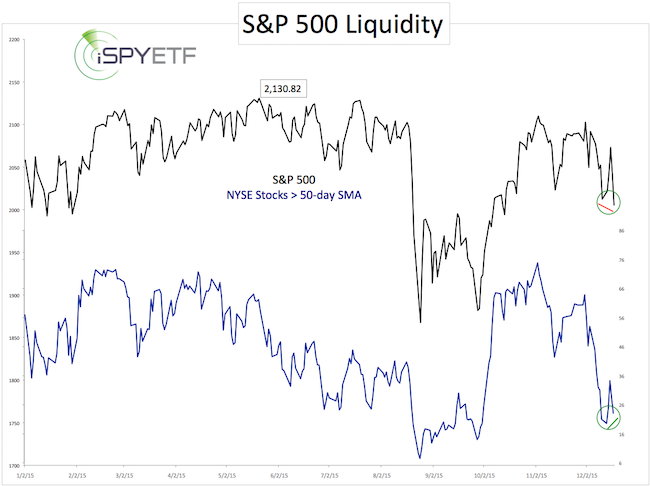 However, for the first time since the start of the 2009 bull market, we are seeing signs of distribution (liquidity is drying up). This could become an issue when the next (bullish) VIX turning point arrives.